Daniel Kemph, a Lexington business analyst, came to the Bluegrass from California six years ago. He’s clear that his decision to make an inaugural political run came right after the presidential election. “I thought, that after the 2016 election, that authenticity mattered, honesty mattered. It mattered to the voters. I also thought there was an awakening about how politicians address issues,” said Kemph. While Kemph is making his first run at office, retired state engineer Geoff Young is running for the fifth time with no wins thus far. Young says he felt the need to run. He fears an all out global nuclear war is possible. “The situation in Washington is that serious. Our so called leaders are that aggressive and reckless,” noted Young. Ted Green was born in Montana. He says he’s migrated around the U.S. for 50 years, learning about America and ended up in central Kentucky. 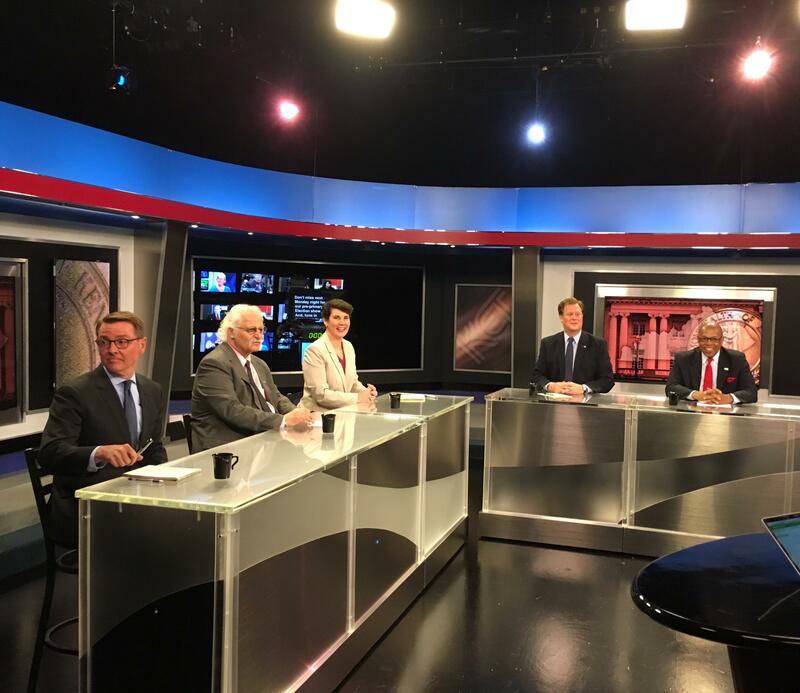 Green, who appeared with the other five candidates on KET’s Kentucky Tonight this week, said he believes Washington politicians are, by and large, not connected with citizens. “These people, meaning representatives in Washington just don’t simply seem to care what’s going on out here with the people. So, we need somebody in Washington that’s going to care for the people, going to speak for them,” explained Green. The economy often influences voters as they go to the polls. Kemph believes government can still play a bigger role in creating quality jobs. “We want to know that we are making a contribution, that we believe in the work that we are doing. We don’t just a ‘job.’ We don’t want just work. We want more than that. And I really believe in that and that’s something we can pursue. That is something the government can participate in,” said Kemph. Kemph says too many rights have been given over to corporations and their push for profit has become more important than the experience of the workers. Young, meanwhile, calls himself a lifelong environmentalist. He says his work as an engineer in state government bears that out. “The mission of that office was to improve energy efficiency in all sectors of Kentucky’s economy and to promote renewable energy technologies, such as solar-wind power, alternative fuels for vehicles so it would be less polluting,” said Young. Green says his lifelong travels all over the U.S. have included taking in a common sight. “Every place I go I see suffering. I see people in the streets. I see people sleeping under bridges. People getting their food out of dumpsters and garbage cans. This is not how America should be,” noted Green. One perpetual issue of Congress is immigration reform. Kemph said Congress’ inability to move on reform “gets under my skin.” “It’s our responsibility to have an immigration policy that allows them to get in line and to qualify for citizenship and to eventually achieve it, proving themselves to be quality citizens. It’s not the immigrants failing. They do everything they can,” said Kemph. Young believes a single payer health care system is what he terms the gold standard. He says modifying the affordable care act is not feasible. “They say, oh we need to tweak what we have now. That is a prescription for political failure,” contended Young. Green admits health care is one of the pressing matters for central Kentuckians. But he also says, it’s difficult to single out only one key issue. “It’s almost like throw a dart and then start working on that. But, I think the most important things we need to deal with first is these health care issue and the opiates. And those two, kind of run hand in hand,” said Green.